There are three ways you can order products online at Banners.com: Browse Templates, Upload a File or Work with a Graphic Designer. Click here for more information about the three different ordering options. We will be discussing the "Let us Design" option for our most common product, Full Color Vinyl Banners. For best results, please create an account prior to starting your order to save steps in the checkout process. Click here for more information about creating an account. The first step is to choose your product's height and width from the drop down menu. You will then select the quantity that you need. 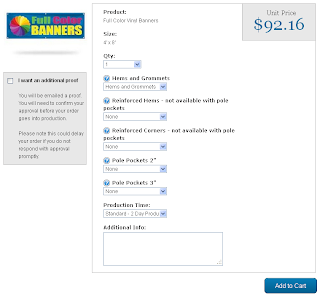 The second step is to select which product options you want your banner to have. The standard finishing is heat welded hems and grommets, but you can also get 2" or 3" pole pockets, reinforced hems and reinforced corners. 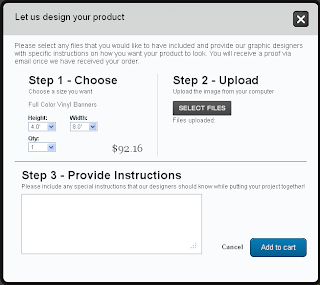 Step 3: Choose Design Method "Let Us Design"
You will need to click on the "Let Us Design" button. This will bring up a pop up window where you will be able to upload any files you want included in your design. You will also need to provide instructions for the graphic designer. Once you are finished, click on the "Add to Cart" button. The next step is to review your product options. You will be able to change the quantity of banners and edit any of the options you selected. You will also be able to select your production time and add any additional information about your order. There is also a check box where you can select whether or not you want to get a proof from a customer service representative. Regardless of if you check the box or not, you will receive a proof from the graphic designer via email. You will have to approve the proof via email before your order goes into production. When everything looks correct, click on the "Add to Cart" button. 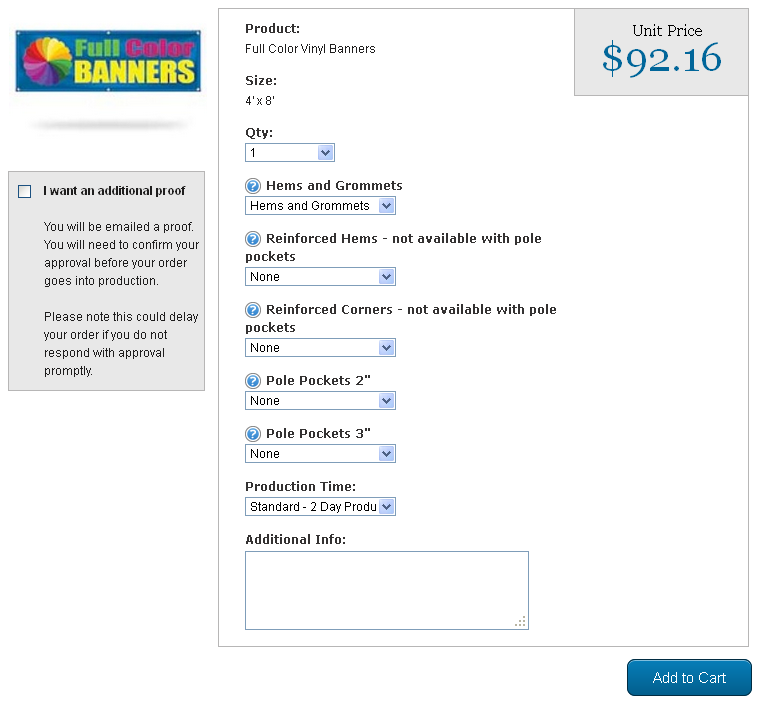 In the shopping cart you will still be able to edit the quantity, and remove any unwanted products from the cart. You will also be able to apply any promotion codes. 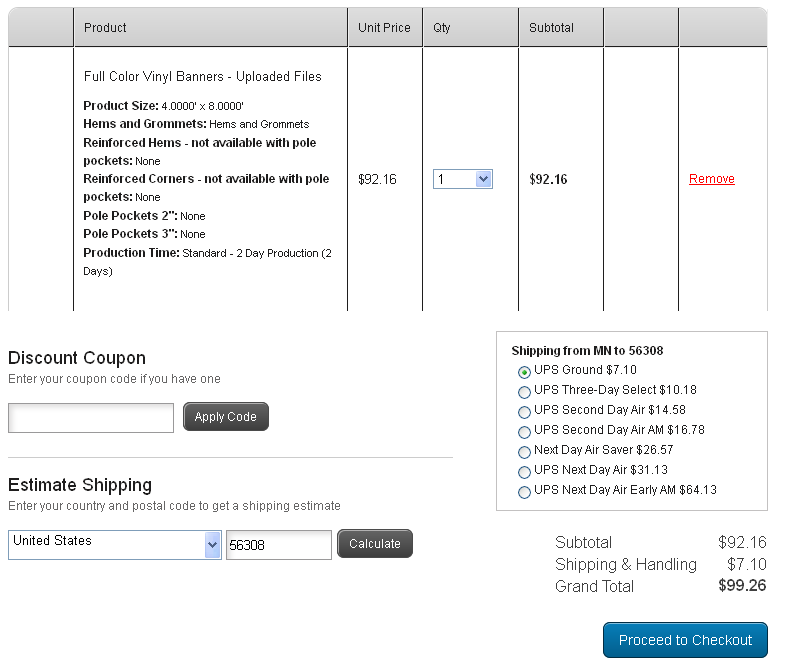 Once you enter in your shipping zip code you will be able to see the UPS shipping options available. 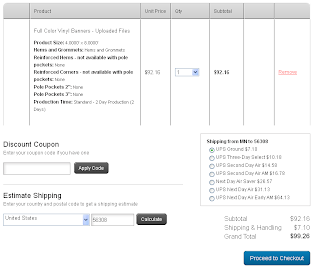 Click on the "Proceed to Checkout" button when you are done.